It has been three years since Alter Bridge's last studio album Fortress was released, it's been clear their fans have been eagerly waiting for them to return and return they did! With their fifth studio album The Last Hero, released in October 2016 on Napalm Records, Alter Bridge stormed the worldwide charts and returned with a masterpiece that builds upon the sound that Alter Bridge has become known for with their uncompromised vocal melodies, untouchable dueling guitar work and pounding rhythm section. 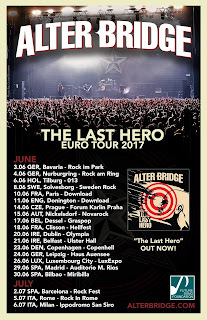 In support of The Last Hero and after recent headlining tours all over Europe, the UK and the States, the rock juggernaut comprised of Myles Kennedy on vocals/guitars, Mark Tremonti on guitars/vocals, Brian Marshall on bass and Scott Phillips on drums, will return for an extensive summer run and have now announced exciting European summer dates and festival appearances!